While the vibrating table presents multiple small problems to be solved, production of moulds is based upon one basic decision: injection moulding or not. Only injected moulds will fulfill high demands for true shape, strength and longevity as specified in the Equipment Quality Guidelines. 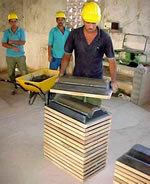 So far any other method has proven insufficient for the production of quality tiles, which fulfil the criteria of "Standard Guidelines" (FCR/MCR Toolkit, El. 4). As everybody was clear that tooling for mould production was a major cost factor, no experiments were to be made there. Good moulds were examined, their form computer-analyzed and their cross-sections inspected. Actual production of the injection mould was quick and unproblematic because factories with the most modern equipment were able to take on the task. One firm was involved in design and tooling, another in the injection technology. However, it did cost Cecat a total of $40,000 cash, apart from the previous engineering work done by Cecat and the commercial companies. The specialists rapidly identified the proper type and quality of the raw material and production began on the most modern equipment available with an injection force of more than 100 tons. Cecat asked Sofonias to serve as a marketing channel because of the complications of the Cuban situation internationally. Thus, in order to facilitate access to reliable equipment it formed a commercial branch called EcoTec. However, it was clear to everybody involved, that equipment would have to be available in each country, to be bought off the shelf. This involved additional risk capital, which was assumed equally by Cecat and EcoTec, in the amount of some $40,000 each.